It has been a busy start to the year for us in Hoowla. We have welcomed a number of new firms onto our conveyancing software, Natalie Williams an Ex conveyancing solicitor has joined our growing team and we have made some exciting improvements to our software. Read on and as always, if you have any questions or feedback then please do get in touch. “I’m very pleased to be joining Hoowla, the team are extremely focused and pride themselves on delivering a fantastic service to the legal industry. 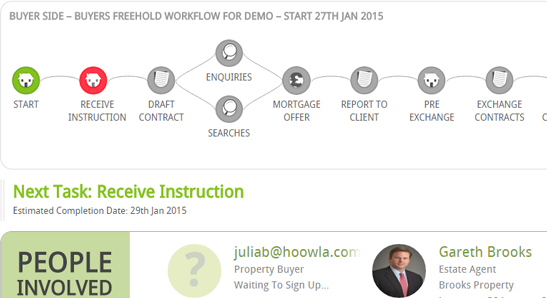 As an Ex conveyancing solicitor I know how important it is to communicate clearly with clients and it’s refreshing to see Hoowla develop ways that make this easy for conveyancers. 2015 is shaping up to be an exciting year for the conveyancing industry and I’m looking forward to tackling the new challenges that await me”. We’ve made improvements to our case screen including a brand new layout which we launched on Wednesday. You can now clearly see the next task to work on and and the case control panel contains all the tools you need in one easily accessible area. Following the new case screen design we’ve launched a brand new task screen allowing you to easily access all the information and tools associated with each task in your workflow. 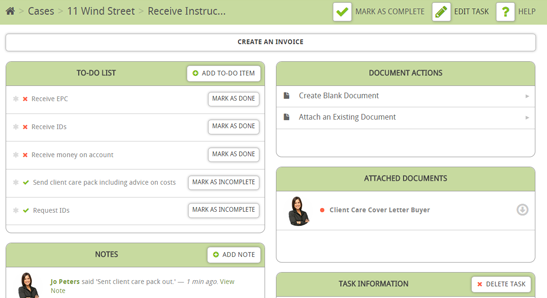 Manage to-do lists, record notes, write letters, share documents and much more.